Call of Duty is a blockbuster franchise. These games are created in order to appeal to the widest possible group of people while keeping them entertained and excited. Just as importantly, a blockbuster wants to get you excited for future iterations of itself. Blockbuster franchises want to live forever. Any discussion of Advanced Warfare has to start from the baseline understanding that it is a videogame that exists as a rarefied media object. It cannot stray too far from its predecessors, but it also cannot be a mere repetition of its previous iterations. It is a first-person shooter game with a military setting, so it has to tread lightly around certain issues. At the same time, it cannot buy wholeheartedly into militaristic chest beating, because that would be seen as hopelessly naive and irrelevant. Advanced Warfare, from the conception of its narrative, architectural, and mechanical design, is forced to walk a much tighter line than critics of the series or genre might admit. The Call of Duty games are at their most successful when they are making leaps forward in both mechanics and narrative delivery at the same time. Modern Warfare and Modern Warfare 2 are exemplary in this regard, completely altering the player’s perception of how they can move around in a first-person shooter world as well as changing what kind of story players can expect from games in that genre. While the effectiveness of these “leaps” in narrative delivery depends on how charitable you are as a critic, it is undeniable that missions like “Shock and Awe” or the infamous “No Russian” were attempts to do something new and critical in blockbuster videogaming. Advanced Warfare, as the title suggests, wants to be the next revolution in the Call of Duty series. 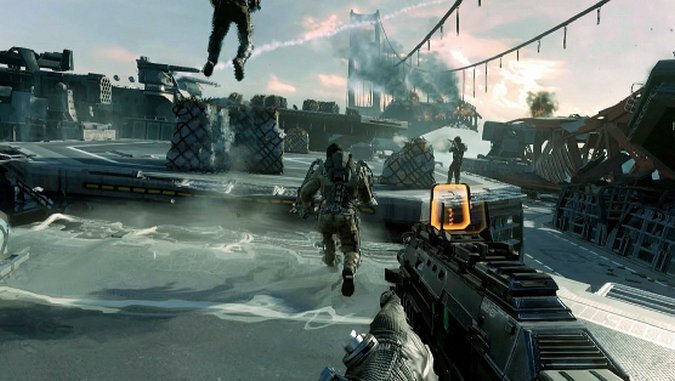 It wants to cut the same wide swath in the field of shooter game design as the original Call of Duty and Modern Warfare games did when they were released. It wants to leave the world of gaming fundamentally changed. And, to some extent and against all of my expectations, it manages to. I want to say here that I’m not a “fanboy” of any particular game franchise (or even genre, if I’m being honest). I try to be the kind of critic who moves seamlessly between massive blockbuster releases and games released on small, personal platforms like itch.io. My own attempts to cover the full breadth of gaming itself have forced me into a weird dialectic of positivity and pure nihilism: everything is beautiful, everything is garbage. What follows this is the most measured review I can form of Advanced Warfare. I am neither an acolyte nor an enemy. I just play videogames. Playing videogames—and then writing about them—means that I’m often thinking about what the Call of Duty games have managed to revolutionize in the past, at least a couple of times: the melding of narrative with mechanics that feel good to repeat over and over again. The shooter genre in particular has a difficult history with making this pairing work well. How do you create a gripping and powerful story that generates real pathos in a player when you’ve created a world fundamentally structured by the destruction of life and property? How do you build something beautiful out of something so profoundly negative? Game designers have attempted to find their way out of this conundrum by leaning into their games’ mechanical weaknesses. If a shooter is too linear, thus inevitably leading to the same conclusion time after time? “Would you kindly?” answers that problem. You press R2 to kill a thousand enemies throughout the game? Press R2 to end it all. You can only interact with anything in the world through a limited vocabulary of “Press Square to X”? Press Square to crawl in a mass grave. 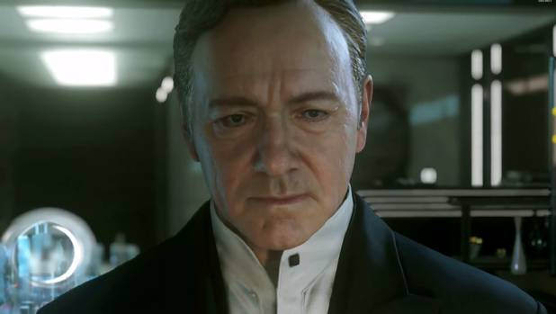 In Advanced Warfare, you press Square to pay your respects. As soon as review copies of the game were out, we saw the screenshot blow up on Twitter, confirming critics’ worst thoughts about the series: this game is merely all of these games one more time. Part of the critique comes from expectation, and another is a kind of face-palming at the idea that a game could try to communicate something so profoundly emotional as a death with a single press of a button. A more charitable read on the situation: the player takes on the role of Jack Mitchell, a Marine living in the year 2054. On a combat mission in South Korea, his best friend Will Irons is trapped while performing a sabotage mission for a mobile attack platform. Mitchell falls to the ground and escapes while Irons is killed by the ensuing explosion. As Mitchell lies on the ground, a piece of debris flies toward his body. As he is dragged away by his commanding officer, we realize that his left arm has been severed, mirroring the trapped arm of his comrade. In the next scene we are standing in front of the coffin, listening to a speech. We receive a prompt to pay our respects, we press the button, we look down at the coffin past the sling where what is left of Mitchell’s severed arm rests. It lasts maybe five seconds. Paying your respects is purely trivial in the same way that pressing a button is. Two minutes later you are embroiled in a combat mission working for the largest private military corporation in the world. Advanced Warfare is a blockbuster. It keeps its arguments simple and its storytelling methods tried-and-true. Jonathan Irons, played by Kevin Spacey, is yet another gray area “hero of his own story” villain whose overarching plot threads are both boring and predictable. At times, in voiceover provided by protagonist Jack Mitchell (played by Troy Baker), we hear that good men fight for the wrong reasons and death comes for all of us, sometimes too soon. This overarching narrative is saccharine and trite, especially in the context of the hundreds of thousands of TV shows, films, novels, and games that try to explain the horror of the average soldier in warfare. However, I don’t want to mislead you. Despite the fact that Advanced Warfare feels like it was written by a committee who happened to all be in the same Action Film 101 workshop, it is still better than 90% of other videogame narratives. Plot threads are introduced, complicated, and resolved with the speed of a Michael Bay or Christopher Nolan film. Characters are developed well. The cast of those characters are diverse without being pandering, and each is a rounded human being rather than a one-dimensional caricature. They bond together, work as a group, and seem to generally care for one another. This is one of the game’s biggest successes and it shouldn’t be overlooked. This all rests within the container of the shooter game, and so the question you never want to utter out loud is actually operative: “How’s the shooting?” The answer is pretty simple too: it’s good, I guess, or whatever. The characters of Advanced Warfare all wear exo suits, which basically look like weird hugging machines that are attached to their bodies all the time. These suits give their wearers superhuman powers. For example, you can kick through a solid steel door or punch a human into a wall. (Never mind that the suits make no sense visually, and that doing any of the superhuman things that you’re shown doing would liquify your bones.) The virtue of these suits is that they make the player more nimble in a lot of different ways. You can now “boost dodge” in the four cardinal directions. You feel a lot lighter. You can, at times, double jump. You have new weapons with which to shoot faceless enemies. In all honesty, the only thing that has changed in pure gameplay terms here is the number of enemies. You’re still shooting, moving, resting, and repeating, but now there are sometimes dozens of enemies at once. These enemies don’t seem particularly smarter than any enemies in the past, mind you. They mostly do the same things you do, sometimes adding “running away” to their repertoire, and you shoot them like it’s target practice. I spent quite a bit of my time with Advanced Warfare smiling. I was nodding. I experienced it the same way that I experience the Transformers films. It is a symptom of contemporary life, particularly contemporary American life. This thing was produced for us so we could see something projected for us and reflected back at us. Jack Mitchell’s roller coaster ride through tragedy and action hero status is part and parcel with the American Dream itself. Adversity beats him down, he overcomes it, he wins the day. Advanced Warfare strikes a very difficult balance between the ideology and spectacle that the genre of the blockbuster necessitates while grasping for something new and original. In its best moments, it reaches something wonderful, and in its worst moments, it is merely what you expected to begin with. Cameron Kunzelman tweets at @ckunzelman and writes about games at thiscageisworms.com.